Python® Programming online training course by Multisoft Virtual Academy is meant for both beginners, as well as experience IT programmers who want to learn the Python® programming language. 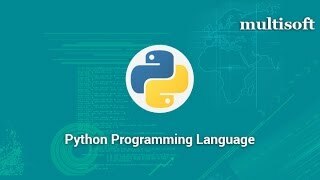 Ideal for all programming individuals, Python® is one of the most widely-used languages as it is open source, facilitates high-level coding, and is general purpose. When candidates learn Python® online, they are equipped with Python® 3â€™s (latest version) programming fundamentals. After completing the Python® Programming online training course, students are able to use the language for Web programming, XML processing, game programming, rapid prototyping and more. Participants build expertise in various Python® concepts, including Operators and Expressions; Data Structures; Control Flow; Functions and Modules etc. This Python® Developer training involves students in real-time projects by making them work on live application development tasks under expert guidance. Participants develop confidence to hit the professional world and meet its dynamic demands of application development, including games; GUI & Database apps; scientific implementations etc. After completing the Python® Programming Online Training, candidates will get a training certificate from Multisoft.